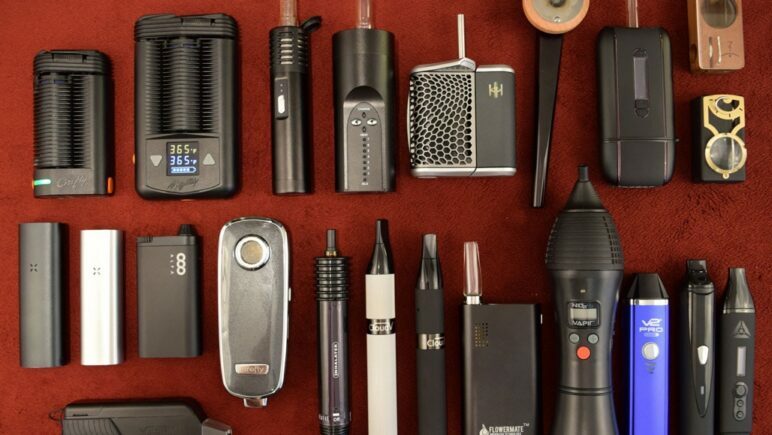 The article describes about the top 10, most portable and best vaporizer, that are suitable for your personal use, particularly if you want to use dried herbs for vaporizing. We have concluded some of the best vaporizers that are currently present to fulfill your needs and requirements. In the year of 2018, some of the latest advancements and modifications have been made, especially in terms of dried herb vaporizers. Although the size and shapes of these vaporizers have been getting smaller, but their activity have been enhancing, along with their increased battery power, and more advanced additional features and qualities. Mighty has proven to be the best vaporizer available in market. Although, the development and introduction of this vaporizer have been made in 4 years ago, but still, the device has been preferred by number of people because of its high end desktop qualities, its efficient performance, and also the flavorful and smooth pulls are something, that you will be urged to purchase this device for sure. There are numerous features present in the device, which includes high quality of vapors and also it is super easy to use. The device is associated with a screen, in which easy processing through up and down options have made its use easier. With the help of these controls, you may easily control the temperature. The device also contains a safety feature through it automatically gets turned off in case you forget to turn it off after using. It runs through the process of both conduction and convection heating techniques. It is a renowned brand available I n the market and retail stores, works well with dried herbs for vaporizing and also comes along in a reasonable price. The battery life is even better as compared to Mighty, since it may easily run the device for up to 3 hours. This provides it the quality of having longest battery life among all the other vaporizers. The device contains a feature of hybrid ceramic/stainless steel heating system which provides the user with vivaciously delicious and thick vapors. Among some of the best vaporizers available in the market, Pax 3 has also been a remarkable addition in the category of best vaporizers. Apart from the remarkable internal features, the external of this device has also been made in sleek and stylish form, which appeals most of its customers. The new look, in which the device has been provided in matte colors is also a big hit for vaporizer users. Pax 3 is device which is also provided with internal qualities, like the heating system of the device gets activated within 15-20 seconds only, and the user may easily utilize this device immediately after turning it on. The most distinct feature this vaporizer contains is lip sensing technology, through which it senses out your lips, and promptly activates the internal heating system of your device. Battery life of this device can be used for upto 90 minutes if it is fully charged. Davinci is the brand who has been making these vaporizers over five years now. There have been a lot of advancements in their designs and features ofthe devices that they launch every now and then. But the recent production and modification of Davinci vaporizer, which is launched with the name of Davinci IQ, has been the best development by this company so far. They provide all of the qualities in a single device, but the most remarkable feature is its sleek and stylish look. It gives you an appearance of a thin and sleek pen, embedded with a digital LED screen over the device, through which you can easily control the menu. It may easily run upto for 1 hour, since the battery life is less, that is the core reason observed, that people do not consider purchasing this device more often. Firefly 2 is the second version, of the originally introduced Firefly vaporizer. Although, the first development of this vaporizer had a great impact on the market, but because of certain complaints about its battery life, size and lack of temperature control, the product failed. Afterwards, Firefly had been modified in order to overcome all these complains of their customers and provide them with something that is affordable, stylish, easy to use and with all the desired features as well.Thedevice contains 6 different temperature settings and you may easily select any one of them ranging between 170 and 225 Celsius. But there is a condition applied to this device that it runs specifically via Firefly app, so make sure you possess a smartphone in order to use this vaporizer. Crafty is also a modification of mighty, but it is cheaper as compared to mighty. It is also associated with a use of application, through which you may control its settings. It also contains an additional feature of pass-through charging which means you may easily use the device even when its charging. This type of vaporizer is the cheapest among all of the other vaporizers present in this list. It provides you with number of features like increased battery life, prompt heating system which turns on the device to be ready for usage within 15-20 seconds. Also, the device is best for those who prefer to use small vaporizers which are easy and portable to carry. These are two different devices that differ only in terms of their size, presence of LED and battery life. Boundless CF is comparatively the smaller one with a battery life of only 50 minutes and it is also cheaper in price, while Boundless CFX is larger in size, and it also possess a battery life of 60 minutes. The most distinct and prominent feature that Arizer Go device comes with, is presence of a glass covered mouth piece. This feature not only provides you a highly elegant and classy look but also enables you to just throw the device in your pocket without having the danger of getting yourself burnt. The size of this vaporizer is almost similar to that of Davinci, but the exterior appearance is best one so far. The battery life can be easily used upto 90 minutes. Finally, the last one we have in our list is Haze 3. It is a dual chamber vaporizer which means it contains two different chambers which can be filled at the same time. With the help of this feature, you may easily switch up to any of these two flavors whenever you want. It contains a patented stainless steel heating system, which is essential for handling the dry herbs. It can also be used for oils and wax. The device heats up only within 60 seconds, and provides thick and flavorful vapors to the user.